• Are you living the fullest expression of who you are? • Are you boldly sharing your voice with the world, full out and on your terms? If you are Congratulations and a Rebel Belle Yell! 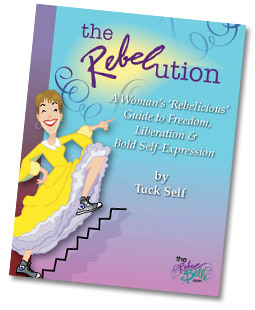 Join me Monday July 18th at 8 PM ET/5 PM PT for a li'l 'Tuck Talk' on Claiming Your Rebel. In Step 3 of The "REBEL-UTION you'll learn how to give yourself full out permission to do what YOU love to do! You'll tap into your power, passion and genius and discover how to share that with the world - big, bold, 'rebeliciously' and on your terms. Discover what makes your heart sing. Live your one and only fabulous life filled to the brim with Passion, Purpose and boatloads of Play! Grab those petticoat ruffles, life that skirt and high step your way to a whole new fun and fabulous life!